Your wooden floor is faded and you are wondering what changes you could make to give it a fresher look and a modern taste? Choose a wooden floor that has a bold color, very pale or very dark, and give it a satin or matte finish. The 2017 trends suggest moods to loosen up and unwind in a peaceful environment! 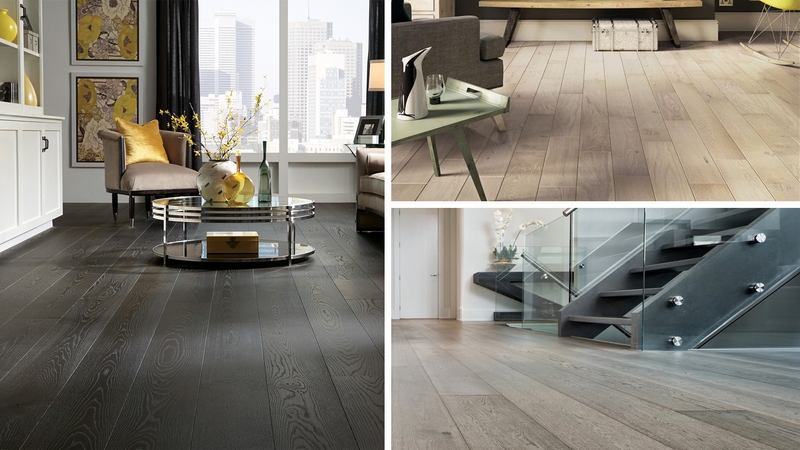 This year’s trendy colors for wooden floors are pale blonde, espresso brown, therefore very dark, and gray. The wooden floor colors trends lasting approximately 5 years, it is important to make sure you opt for a color you’ll like in the long run and that you won’t want to change in the coming year. Espresso brown is often selected to contrast walls and furniture that have a pale color. The color on the opposite side of espresso brown, very pale blonde, is also very trendy this year. It will provide to your room a larger, clearer and more open look. Gray floors also continue to gain in popularity with home owners. It is a color that is neutral and soothing. Discover the wide color variety of Finitec’s waterborne stain to restore your floors yourselves. It is simple, easy and so beautiful! In choosing a different finish while restoring your wooden floors, you’re giving them a whole different look. Nowadays, the consumers are choosing finishes that give a more natural appearance to their floors. Pursuing since last year, the trend is to satin or matte floor finishes. They are less reflective and less glossy. Therefore, the surface imperfections are less visible. The satin finish offers a good compromise between a glossy and a matte look. As for the matte finish, it is increasingly gaining in popularity. Even though it is less popular than the satin finish, it is experiencing an interesting growth in the industry. The matte finish is getting closer to the raw, the natural and even the rustic aspect of the wood. Click here to learn more about the satin and matte Finitec’s waterborne finishes. Transforming your home in term of wooden floor gives you the opportunity to follow the trends while allowing you to unwind from your daily routine. Never forget that your floor finishes protect your investment, your wooden floors. Whatever luster level you choose, make sure you have a high quality product that is effective and easy-to-use. Discover our complete range of wooden floor solutions by clicking here.